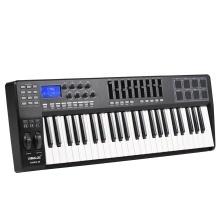 USB MIDI keyboard pad controller with 49 assignable velocity-sensitive keys, 1 master volume slider and 8 assignable sliders. 8 assignable trigger pads with colorful RGB backlit in working status, comfortable and accurate. 8 assignable knobs, programmable and 360° infinitely rotating; 8 control buttons，each button can support dual functions via the shift key. 6 buttons for MMC and 10 data entry buttons; Pitchbend and modulation wheels can be assigned as 135 controllers. With 2 assignable pedal (A & B) interfaces and MIDI IN/ OUT; USB 2.0 powered, plug and play, no need of driver installation. Compatible with Win 10/ Win 8/ Win 7/ XP/ Vista/ MAC OSX; Compatible with CAKEWALK, FL Studio, Pro Tools, Ableton Live, Logic Pro, CUBASE, Studio One, Piano Apprentice, Lgrand Piano, Music Studio and other mainstream music software or APP.